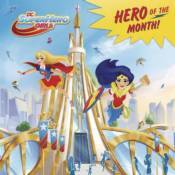 Meet Wonder Woman, Supergirl, Batgirl, and all the other DC Super Hero Girls in this book with an animated cover! At Super Hero High, the galaxy's most powerful teens develop their powers and learn what it means to be a hero. Meet Wonder Woman, Supergirl, Batgirl, and all the other DC Super Hero Girls in this information-packed book that will introduce young fans to their favorite super heroes - especially those who have earned the biggest honor: the Hero of the Month award! This deluxe Pictureback comes with added values such as stickers or cards or cover effects.